Marshalls introduce the RhinoGuard™ Blok 72/40 Protective Seat, a seat which has inner strength, outer beauty and protects people, places and infrastructure without compromising the appearance of the space. RhinoGuard™ Blok is made from concrete and can come in a variety of finishes to integrate with the existing landscape, or alternatively you can add a timber cladded top for a more modern look. The seat has been designed and tested showing it meets the requirements of IWA14-1:2013 and achieved a successful certificated rating. 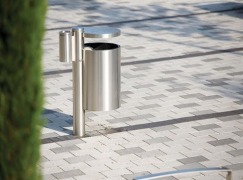 The Bellitalia PAS rated Large Giove Protective Planter provides an elegant solution for introducing planting tothe public realm. Fitted with our innovative RhinoGuard technology, the Giove features a large 1,224litre capacity and is designed to accommodate the root ball of a tree. The Geo PAS 68 Bollard offers a high level of hidden security against vehicular attack without compromising contemporary design or generating a sense of concern for the general public. The Geo PAS 68 Cycle Stand offers a high level of hidden security against vehicular attack without compromising contemporary design or generating a sense of concern for the general public. The Geo PAS 68 Bin offers a high level of hidden security against vehicular attack without compromising contemporary design or generating a sense of concern for the general public. Providing effective protection of critical infrastructure, people and places, Marshalls introduces the RhinoGuard™ 72/50 Shallow Mount Protective Bollard, providing proven levels of performance at a distinct level of protection and budget. 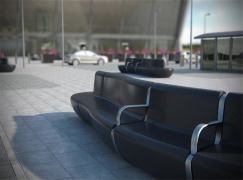 Igneo is a modular seating system that offers unique styling, combined with functionality and exceptional impact performance. The 15/30 bollard has been successfully crash tested in accordance with the BSI PAS 68 standard. The bollard allows designers to create effective hostile vehicle mitigation measures within their schemes. The 25/40 bollard has been successfully crash tested in accordance with the BSI PAS 68 standard. The bollard allows designers to create effective hostile vehicle mitigation measures within their schemes. Creating Safer Spaces... What is PAS68? Following events in recent years, the threat that vehicles pose to the public has been highlighted to unprecedented levels. Marshalls places an emphasis on the development of physical perimeter security products designed to protect people, places and infrastructure from the threat of vehicle-borne attacks whether intensional or accidental. Marshalls RhinoGuardTM products have been successfully tested in accordance with BSI PAS68, PAS69 and IWA Standards for vehicle security barriers as set by the Government and key agencies such as The Home Office, Office for Security and Counter-Terrorism, The Centre for the Protection of National Infrastructure (CPNI) and The National Counter Terrorism Security Office (NaCTSO). The Standard tests a specific vehicle weight impacting a barrier at a specific speed (for example, a 1.5 tonne vehicle crashing into a bollard at 30mph). Testing weights range from 1.5 tonnes to 7.5 tonnes at speeds of either 30, 40 or 50mph. As an active member of the Perimeter Security Suppliers Association (PSSA), Marshalls designs and supplies products to provide effective hostile vehicle mitigation in proportion with all levels of risk, site vulnerability and project budgets.